I was looking for a different way to display the ribbon that we carry at Sunnyside Cottage when I came across a picture in the Where Women Create magazine of an artist's studio. On one of the shelves pictured was a Mason jar full of ribbon and I decided there and then that that was the look I wanted. I went next door to Oliver's Market and bought the first of many cases of Mason Canning jars. Online I was able to find a lid for them with a coin slot cut out which was perfect for pulling the ribbon through so you didn't lose the start of the roll. 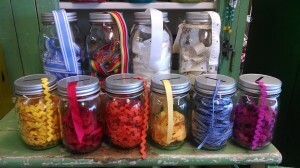 You can see from the picture how colorful and fun the ribbon looks in the jars. Pinterest is full of creative ideas for using Mason jars- they are a versatile vessel for storing and canning and decorating alike. I love drinking from them and eating from them is also a pleasure. To me, they evoke a memory of simpler times. Thanks Marsha! Saltine crackers and homemade jam, what a treat! Hi Debbie, I feel the same way about glass canning jars. I remember my grandmother making apricot jam in them and putting the jam on saltine crackers, my love snack today. I also think garden roses look their best in mason jars. I know that “vintage” feeling that you are talking about. I like your new website.